Because aquatic invasive species can have devastating effects in Oregon waterways, invasive species managers want to take all precautions to keep these organisms from entering into or traveling around our waters. These plants and animals can be difficult to differentiate from our native species, which is why the Oregon State Marine Board and Oregon Department of Fish and Wildlife have implemented a Clean, Drain, Dry approach to keeping boats free of any and all aquatic species when out of the water. How do you "Clean, Drain, Dry"? Clean all aquatic plants, animals and mud from your boat, motor or trailer and discard in the trash. Rinse, scrub or pressure wash, as appropriate away from storm drains, ditches or waterways. Lawns, gravel pads, or self-serve car washes are best. Drain your motor, live well, bilge and internal compartments on land before leaving the waterbody. For paddle boats, drain by inverting or tilting the craft, opening compartments and removing seats if necessary. Rinse or flush under flooring, at inflation chamber joints or other areas that can trap mud and debris. Dry your boat between uses if possible. Leave compartments open and sponge out standing water. Find a place that will allow the anchor line to dry. Also, empty your bait bucket on land before leaving the waterbody. Never release live bait into a waterbody, or release aquatic animals from one waterbody into another. What's the Problem with Aquatic Invasive Species? Aquatic invasive species—primarily plants & animals—can flourish in our waterways, choking out native plants that once grew there and clogging boat, hydropower, and irrigation infrastructure. Examples of these species include Zebra & Quagga mussels, Ludwigia, Water Hyacinth, and New Zealand mudsnails. Learn to recognize these species and report any you find to the toll-free Oregon Invasive Species hotline, 1-866-INVADER. ALL WATERCRAFT MUST STOP AT AN OPEN WATERCRAFT INSPECTION STATION FOR WATERCRAFT INSPECTION. A watercraft is any size or type of motorized or non-motorized boat (kayak, canoe, raft, stand up paddle board, surf board, etc.). For more information on the Aquatic Invasive Species Prevention Permit or Inspection stations, please visit the Aquatic Invasive Species Prevention webpage or visit the Aquatic Invasive Species Program FAQ webpage. 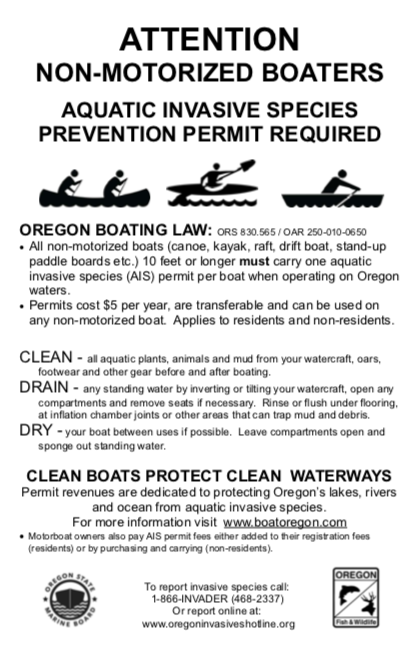 The Aquatic Invasive Species Prevention Program is managed by The Oregon State Marine Board (OSMB) and Oregon Department of Fish & Wildlife (ODFW). OSMB manages funding, provides education and outreach materials, signage at the boat ramps, and oversees enforcement contracts for the program and ODFW runs the inspection stations. For more information on education and outreach efforts, please contact Glenn Dolphin at OSMB (glenn.dolphin@oregon.gov). For more information on boater inspections or inspection stations, please contact Rick Boatner (rick.j.boatner@state.or.us) at ODFW.